An epic storm wreaked havoc on a tropical paradise, forming insane slides, rivers and pools – all of which I got to explore last weekend during my trip to Disney’s Typhoon Lagoon. I grabbed my closest friends, booked our special discounted tickets from TicketsatWork.com, and then we were off to enjoy some fun in the sun. Except we didn’t know where to begin! Keelhaul Falls, Storm Slides, Humunga Kowabunga, Crush ‘n’ Gusher, plus many more awesome water slides were at every turn. We finally chose Gangplank Falls, a waterslide that whooshes your group on a four-person raft down a rocky, water-drenched mountain. To keep the excitement rolling, we dove right into Typhoon Lagoon’s signature attraction: the Surf Pool. As North America’s largest wave pool, we knew it was going to be big—but not that big. Only a handful of other brave souls and I swam out to the front of the line, the deepest you could possibly go, before riding the very top of six-foot high waves with screaming, speckled faces beneath us. But nothing could compare to the Shark Reef experience, one of the most unique underwater adventures I’ve ever done. We all strapped on our mask and snorkel, and hopped right into 68-degree saltwater. Burr! Our chills soon turned into thrills when it was go time! After the drop-off point, we took our time swimming across the coral reef, seeing all of its colorful inhabitants. I said a quick hello to Dory (the Blue Tang fish from Finding Nemo), glided over stingrays, and squealed (loud) at the sight of a Bonnethead Shark, which probably left it more scared than I was. The best part about Shark Reef is it’s included with Typhoon Lagoon’s general admission ticket, no extra cost added. I can’t wait to go back! How about you? There’s no better way to cool off during these scorching summer months than at some of the best water parks in the country. 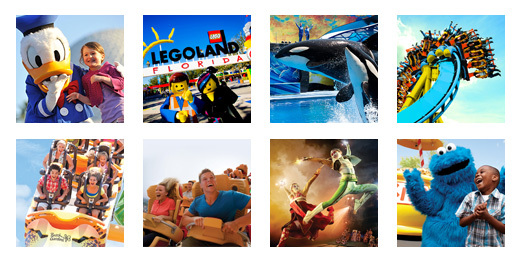 TicketsatWork has an unparalleled selection of water parks near you at incredible savings. So make a splash and have #FunatWork this Water Park Season! Minions will be visiting Las Vegas this June for the Society for Human Resource Management annual conference (SHRM) at Booth #2660! TicketsatWork and Universal Orlando Resort present a Minion Meet & Greet, where you can relax from your SHRM schedule and kiss a lovable minion. Let your Instagram followers get jealous because we will be delivering digital copies of the images almost instantly on-site for Free! Now how did these minions get here? Well, the origin story for the minions will be hitting theaters on July 10 in the feature film “Minions” starring Kevin, Stuart and Bob. But be sure to sign up your company today for TicketsatWork, the leading corporate benefits program in the nation, because you can save big on movie tickets and get free popcorn to boot. That’s something minions would go crazy for… I know my little minions would too. Learn how you can have more #FunatWork at TicketsatWork.com. Plus, we have the best deals on Universal Orlando Resort, where you can even dance with minions. But if “Minions” the movie is what you are looking for, you can also grab discounted Universal CityWalk Meal and Movie tickets, so you can feast at a CityWalk restaurant and enjoy the movie at AMC Universal Cineplex 20 at Universal Orlando. But for now, minions are planning to head to Las Vegas for SHRM. Will you join us at Booth #2660? If you can look out your balcony and see Mickey’s Fun Wheel, Grizzly Peak, The Tower of Terror, and what looks like the back of the mountains of Radiator Springs in Cars Land, you are staying at an Anaheim hotel near Disneyland overlooking Disney California Adventure theme park. I don’t think there’s a better way to start your day in the morning than looking out the window and watching the morning sunrise blaze through the clouds to shine on the theme park where you’ll spend the day. When I first walked into Cars Land at Disney California Adventure, I was greeted by Mater, who was parked by the Cozy Cone for his regularly scheduled Meet and Greet. “Welcome to Radiators Springs…” he said, as he drove off leading the way towards the mountains. As my son and I waved goodbye to Mater, he honked and we were on our way to Radiator Springs Racers, which we had acquired Fast Passes to earlier in the day. Tip #1: Get your Fast Pass for Radiator Springs Racers early, they can be found before you pass A Bug’s Land.